Afterthoughts: I have a Burmese student who told me that Myanmar is hosting the Southeast Asian games (SEA) next December (2013) and has just eliminated Ping Pong and Gymnastics as events. Why? Because these events will easily be won by the Chinese. (Is China a SE Asian country?) True? Not True? As with many Burmese stories, who knows? And does it matter? The point of the story is to stick it to the Chinese. I could have stayed in SE Asia for a few more weeks. This occurred to me as I was nearly passed out by the pool in Bangkok and decided to have a Thai massage. A lovely 85 lb woman crawled all over me, using her knees and elbows as pressure points while I, dressed in white cotton pajamas, lay there in full view of gawking large Nordic, pink tourists. I won’t be doing this for a while, I thought, and that gave me pause. Once you’ve jumped through the hoop of culture shock: climate, food, water, tummy, language, jet lag, noise – it’s like an investment that you don’t want to waste. Get a visa 6 weeks in advance. Download the form from the internet or use a visa expediter – they are expensive but worth it. Your passport will be out of your hands for weeks and it’s good to know that it’s in someone’s hands. See a tropical disease specialist: Burma does have a high rate of malaria, particularly in the wet months of July – October. The usual travel season of November – early February are dry months with fewer mosquitoes. Malarone is the drug of choice. Think about a series of oral Typhus as well. Bring repellent with 25-30% DEET. Dengue fever is mosquito-borne with no prophylactic and no treatment. Yangon/Rangoon: Most of the hotels are on one of two large lakes with views that resemble uninhabited tropical paradise. This will change soon, I imagine, and those views will be populated with high-rise development. The lakes are crisscrossed with long pedestrian wood bridges. You must pay the equivalent of $2 (as a foreigner) to walk on the bridges. Money: There is no banking system to speak of, no use of credit cards and no ATMs. (As of January 2013). You can change money at the airport and at upscale hotels. Bring US bills, not Euros – new, crisp, unfolded, perfect. Bring high denominations if you are paying for everything (hotels, flights) on site, and smaller denominations if you are buying things in the markets, on the street, or paying for meals in hotels or restaurants. For everything else you will need local currency (Kyat; pronounced chat) at approx. 850 = $1.00. It’s a challenge to walk around with stacks of 1,000 Ky bills. (Definitely not crisp). Don’t over-exchange because you’ll be bringing these home as souvenirs. PS. Bring more US cash than you think you’ll need. We had an unfortunate emergency of sending people home due to a death in the family and they needed mega-cash to buy plane tickets on the spot to get back to Rangoon and out to Bangkok. No credit cards. This may change soon, and probably will, but as of early 2013 – that’s the way it is. We saw some (American) groups on bike tours, which proves that we will do just about anything. The roads are either un-passable, full of potholes, shared with noisy, jerry-rigged trucks that sound like lawnmowers and belch black fumes, or so dusty that you’d have to wear a mask. It’s a testament to either our optimistic belief that we can do anything anywhere, or our total naivety (or some of both, which makes us so unique as travelers). If you’re biking – God bless you. Luggage: If you’re flying internally, and you will unless you stay only in Yangon, bring only ONE bag to check, and one small carry-on. Internal flights board from small domestic airports that operate like bus stations. You get a sticker and a pass with a flight number and you wait in a packed lounge for someone to step up to the door and flash a poster with your flight number. Ideally, you want to chat up people in the departure area who are also on your flight and just do what they do. As you watch the ground crew stuff your bags on the plane (there is no luggage compartment), you understand right away why there is a one-bag limit. Food: Chopped tea leaf salad (fermented tea leaves served in a lacquer dish with condiments of peanuts, lentils, sesame seeds and spices). Corn and rice sweet pudding. Crispy baked rice cakes in white rice and brown rice. (Somebody please import these – they will put our cardboard rice cakes to shame.) Papaya and watermelon. Vegetable tempura, blaked tofu chips, samosas, fishcakes steamed in banana leaf. Lots of cooked root vegetables, carrots, squash, pumpkin, peanuts. Fried sticky rice with brown sugar. Large bottles of beer. No spring water – all water in bottles purified. The food is neither Indian, nor Thai nor Chinese but with hints of each. Much less cilantro (thankfully) than the rest of SE Asia. Food could be spicy but they will tone it down. Handicrafts: Marble, alabaster and wood carvings. Hand-pounded thin gold leaf applied to laquer and many buddhas. Laquer-ware in black of varying quality (and hard to know what’s hand-made and what’s machine-made), puppets, silver jewelry. Gems (rubies, sapphires) – if you know what you’re buying. River of Lost Footsteps: A personal history of Burma. 2008 Thant Myint-U (U Thant’s grandson). From the Land of Green Ghosts: A Burmese Odyssey, by Pascal Khoo Thwe. 2003. A memoir. 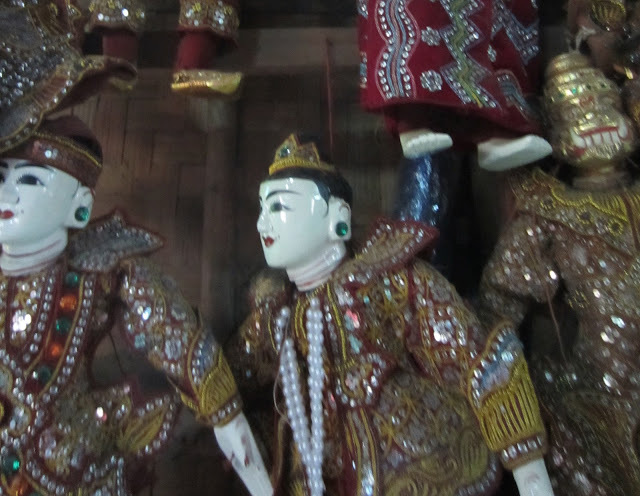 Twilight Over Burma: My Life as a Shan Princess,by Inge Sargent. 1994. A memoir. Living Silence in Burma: Surviving under Military Rule, by Christina Fink. 2009. 2ndEdition. The Piano Tuner, by Daniel Mason. 2003 An historical novel.